Some 101 Snake River sockeye salmon returned to Idaho this year, but just 44 swam all the way to Redfish Lake on their own. To reach 101, it took a combined effort of trapping at both Lower Granite Dam on the Snake River in Washington state (51 fish) and Sawtooth Fish Hatchery on the Salmon River in Idaho's Stanley Basin (6 fish) -- and trucking them to Idaho Fish and Game's Eagle Hatchery near Boise -- plus the 44 fish that migrated from the mouth of the Columbia River to Redfish Lake. This month, IDFG personnel will increase that return number and release around 650 more adults to spawn in Redfish and Pettit lakes near Stanley, Idaho. How do you turn 101 fish into 650? The same way you turn a single fish into a salmon run - carefully and creatively, according to IDFG. That's what agency biologists have done since 1992 when a lone sockeye dubbed "Lonesome Larry" returned to Idaho, and biologists have used an intensive captive broodstock program to save this endangered species. This is another important year for restoring Idaho's sockeye salmon. The Columbia and Lower Snake rivers had unseasonably high temperatures this summer, warm enough to kill migrating sockeye. To ensure the fish's survival, the regional Technical Management Team, made up of both fisheries and dam operators, provided cold water from Dworshak Dam when it was available to keep water in the lower Snake River cold enough to encourage the fish to pass the dams. In addition, IDFG crews trapped 51 adult sockeye at Lower Granite Dam about 30 miles downstream from Lewiston and trucked them to the Eagle Hatchery, an IDFG facility near Boise. The department has also maintained a captive broodstock program for more than 20 years where sockeye are raised from eggs to adults in hatcheries, and their offspring are used to supplement naturally returning fish. The department releases adult sockeye - either natural or captive-bred fish - into Redfish and Pettit lakes near Stanley and allows them to spawn in the lakes. Biologists have found that naturally spawning sockeye produce offspring that return at a higher rate than sockeye reared in hatcheries. That's one reason why IDFG plans to release 650 adult sockeye into the lakes in mid-September. Those fish will spawn during fall, and the eggs will hatch in late winter. After spending a year and half rearing in the lake, the young sockeye, known as smolts, will migrate to the ocean during spring. Those smolts will be joined by about 900,000 sockeye smolts raised at IDFG's Springfield Hatchery, which was built in 2013 and is devoted solely to raising sockeye. IDFG has seen increases in the annual sockeye returns to Idaho in the last decade and it hopes to continue that trend despite a difficult year when warm water killed tens of thousands of sockeye in the Columbia River, some of those destined for Idaho. Out of 1,053 sockeye that crossed Ice Harbor Dam, the first of four dams on the Snake River, only 50 returned to the Sawtooth Basin, not counting the 51 trapped at Lower Granite Dam. Passage at the next three dams saw dwindling numbers of sockeye: 887 passed Lower Monumental Dam, 579 passed Little Goose Dam and 420 passed Lower Granite Dam. Few made it further. That's the smallest sockeye return since 2007, but still much better than 1991, the year Idaho sockeye were listed as endangered under the federal Endangered Species Act. 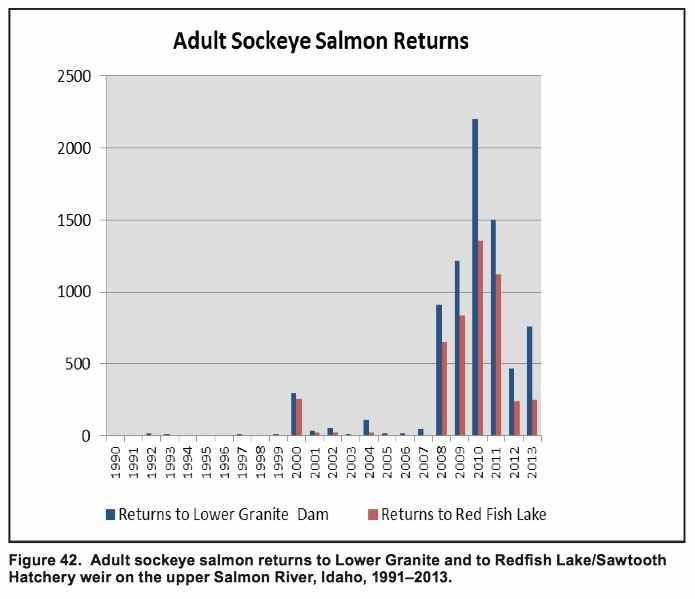 Only four adult sockeye returned that year to the Sawtooth Basin, and the combined annual returns between 1991 and 1998 was 16 fish, which included two years when none returned. In 1999, seven adult sockeye returned, which were the initial results of the IDFG's sockeye hatchery program. Sockeye continued to struggle throughout the most of the 2000s. Fewer than 30 adults returned annually between 1999 and 2007, except in 2000, when 243 fish returned. Thanks to the captive broodstock program and favorable river and ocean conditions, the annual sockeye returns since 2008 have averaged 837 fish, including 1,516 in 2014, which was the largest return to the Sawtooth Basin since 1955. The improvement of the anadromous (ocean-going) sockeye returns and captive broodstock program have allowed IDFG to release sockeye to spawn naturally in the Sawtooth Basin lakes. Since 2008, more than 8,700 adult sockeye have been released in the Sawtooth Basin and the majority of those returned from the ocean. NOAA Fisheries listed the fish as endangered under the federal Endangered Species Act in 1991. From 1985 to 1990 only 58 wild sockeye returned to Idaho. Before the turn of the twentieth century, an estimated 150,000 sockeye returned annually to the Snake River basin. The sockeye in those days ascended the Snake River to the Wallowa River basin in northeastern Oregon and the Payette and Salmon River basins in Idaho to spawn in natural lakes. Within the Salmon River basin, sockeye spawned in Warm Lake in the South Fork Salmon River basin, as well as in the Sawtooth Valley lakes: Stanley, Redfish, Yellowbelly, Pettit and Alturas Lakes. A smaller Sawtooth Valley lake, Hellroaring Lake, may have also supported some sockeye. NOAA Fisheries this summer estimated that "recovery" of Snake River Sockeye Salmon could take 50 to 100 years.